Ok, so, when I asked My sister, Cathy, what I should make for Casey's graduation party, she said "How the pineapple cheesecake squares that Terri always makes?" And I thought..."wait, how do I not know about this recipe?" So, I called Terri. Apparently she found this recipe in a newspaper years and years ago...like, maybe 15 years ago.. and for some reason I missed them somehow. We were talking and laughing about it at the party, and Kim even said "Don't you remember a couple years ago when I called you and asked if you had that recipe?" And I said to her "And I said NO, right? Because I had no idea what in hell she was talking about! Well, Anyway, here they are. I FINALLY made them and OMG I love them! 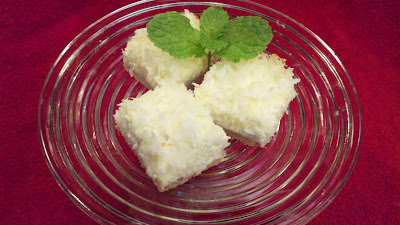 They were actually called Pineapple Cheesecake Squares, but I since there's coconut, I figured this was a better name, don't you think? I suppose you could leave the coconut out, but that just makes no sense to me. Give them a try! Pat into ungreased 13x9 pan. Bake at 350 until golden around edges, 14-19 minutes. Blend cream cheese, sugar, milk & eggs w/ mixer. Blend in drained pineapple by hand. Blend butter w/ coconut & sprinkle over top. Bake for 17-20 minutes at 350. Refrigerate cut bars until ready to serve. Because there's a LOT of butter in the crust, it'll become very soft and bubbly when you bake it. Just let it bake until it because golden around the edges. Oh, and no need to cool it before spreading the filling on top. Make sure you let it chill in the fridge for a few hours before you cut it into squares. When it's time for cutting, I like to loosen the whole batch from the bottom of the pan as much as I can with a large spatula, and then remove half of the batch from the pan at a time. It's just easier to place it on a cutting board and then cut it with a large very sharp knife.